Bookings can be made online for groups of up to 20. During peak times, we recommend booking in advance to secure a time slot of your choice. 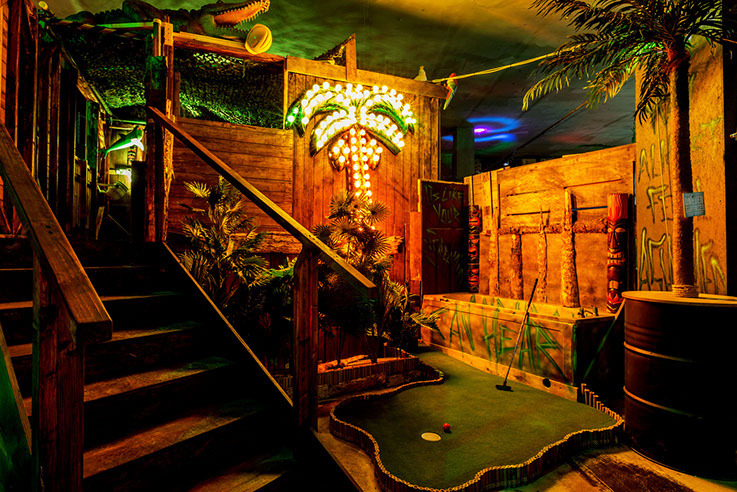 Groups larger than 20 should email bookingsldn@junkyardgolfclub.co.uk to get puttin! Tell me about it for FAQ's sake! What your policy on under 18’s?! Sunday to Wednesday before 7pm, last entry 6pm. One paying adult must supervise every 4 under 18s. If you have a group of OVER 20 playas, please email bookingsldn@junkyardgolfclub.co.uk. We recommend leaving 1 hour 20 minutes to avoid missing your second round. You can always get a drink and some snacks whilst you wait! There are two main bars in the venue serving a great range of cocktails and party snacks, plus a bar halfway around every course. Loser buys the drinks! HELL YEAH! Students get 50% off on Sundays-Wednesdays. Simply show up with your ID or use the code 'STUDENTDIZZY' when purchasing tickets online. Proof of student status will be required at the venue! © Junkyard Golf Club London 2019.